From 7th Jan. to 10th March, and another month during the year (3 months of closing in total). The B & B is located in a medieval Castello in the historical center of Cagliari, we are 20 meters from the Torre di San Pancrazio, 50 mt. the Citadel of Museums, 60 meters from the panoramic Buoncammino Avenue, 300 meters from Royal Palace and the Cathedral. B & B Charming, El Buen Retiro is located in the historical center of Cagliari, in the Castello district, located in an ancient palace of 1600s (declared "HISTORICAL RESIDENCE" from the Ministry of Culture) which is located in Independence Square, opposite the Tower of San Pancrazio in the dominant point of the medieval district of Cagliari. The University (Rector's Office and Secretariat) is 5 minutes walk: the major banks are within 10 minutes as well as the streets shopping. The Via Roma (the harbor) is 15 minutes and the main streets of the city. Elmas airport is 15/20 minutes by car, beach resorts and the beach are a 15 minute drive as well as the tourist port of Marina Piccola. Links with public transport (bus stop in the Palace-tourist train stops in the house. The B & B offers hospitality in an elegant and comfortable and has two beautiful double rooms (double and double single use. One of them with the availability of third bed), bathroom shared among the guests but can be made ​​for the exclusive use . 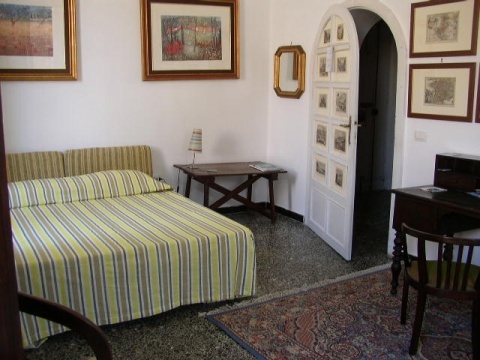 The rooms are newly renovated and are tastefully decorated with antiques and old prints. The spacious and bright, overlooking a indoor garden and enjoy a 'quiet and relaxing atmosphere. They are equipped with air conditioning. Check-in is from 2.00 pm to 9.00 pm ; Check-out from 10.00 am. The B&B are managed by families : is not a reception service open 24 hours. Please to contact by e-mail to communicate his time of arrival, at least 24 hours before.